The company behind Firefox has decided to showcase the power of HTML 5 with a free, online fantasy RPG featuring Portals, Nyan Cat, and Risk Astley. 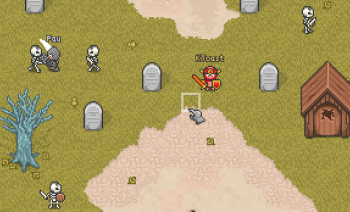 If you don't hate internet-flavored pop culture humor, and enjoy any excuse to wail on ogres with a magic mace, then there are worse ways to spend an hour than firing up Mozilla's new pixel-painted MMO, Browser Quest. The game is available to play for free here, and as you may have already inferred, is completely browser-based, meaning you don't have to sit through any downloads or installs before you can get started. That also means that it can play on most things with internet access, including tablets and smart phones. The gameplay is quite simple; you run around with a melee item of some kind, haplessly wailing on anything that lacks the power of speech. As there's no XP or leveling in Browser Quest, you'll need to get your stat boosts from different armor sets and weapons. Gear comes in the form of loot, and stronger loot is dropped by stronger baddies. You know the drill. Since the game is an MMO, you'll have other adventurers to contend with, forcing you into a bizarre love/hate with your peers. All loot can be picked up by anyone, regardless of who made the killing blow, so you'll beg for a stranger's help to take down a Grim Reaper, then curse their name when they click on the spiffy red demon armor that it dropped before you do. While no game is really "free," the worst you'll have to put up with to play is a few moments of well-deserved self-promotion. The invincibility potion, for example, will temporarily put you in a fox costume designed from Mozilla's iconic logo, and a handful of NPCs will remind you (if you choose to get them talking) that HTML 5 powers the game, and where you can read more about its development. The game isn't revolutionary and, somewhat by definition, is more of a tech demo than the sort of experience many would imagine when thinking of modern MMOs, but it's polished, autosaves your character as you go, and offers a solid game progression through to a final boss fight while letting you interact with some pretty darn funny cameos along the way.